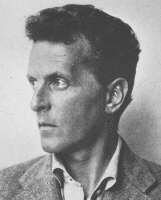 Raised in a prominent Viennese family, Ludwig Wittgenstein studied engineering in Germany and England, but became interested in the foundations of mathematics and pursued philosophical studies with Moore at Cambridge before entering the Austrian army during World War I. The notebooks he kept as a soldier became the basis for his Tractatus , which later earned him a doctorate and exerted a lasting influence on the philosophers of the Vienna circle. After giving away his inherited fortune, working as a village schoolteacher in Austria, and designing his sister's Vienna home, Wittgenstein returned to Cambridge, where he developed a new conception of the philosophical task. His impassioned teaching during this period influenced a new generation of philosophers, who tried to capture it in The Blue and Brown Books (dictated 1933-35). From the late 'thirties, Wittgenstein himself began writing the materials which would be published only after his death. In the cryptic Logische-Philosophische Abhandlung ( Tractatus Logico-Philosophicus ) (1922), the earlier Wittgenstein extended Russell's notion of logical analysis by describing a world composed of facts, pictured by thoughts, which are in turn expressed by the propositions of a logically structured language. On this view, atomic sentences express the basic data of sense experience, while the analytic propositions of logic and mathematics are merely formal tautologies. Anything else is literally nonsense, which Wittgenstein regarded as an attempt to speak about what cannot be said. Metaphysics and ethics, he supposed, transcend the limits of human language. Even the propositions of the Tractatus itself are of merely temporary use, like that of a ladder one can discard after having climbed up it: they serve only as useful reminders of the boundaries of our linguistic ability. This work provided the philosophical principles upon which the logical positivists relied in their development of a narrowly anti-metaphysical standpoint. But just as his theories began to transform twentieth-century philosophy, Wittgenstein himself became convinced that they were mistaken in demanding an excessive precision from human expressions. The work eventually published in the Philosophical Investigations (1953) pursued an different path. In ordinary language, he now supposed, the meaning of words is more loosely aligned with their use in a variety of particular "language games." Direct reference is only one of many ways in which our linguistic activity may function, and the picturing of reality is often incidental to its success. Belief that language can perfectly capture reality is a kind of bewitchment, Wittgenstein now proposed. Thus, philosophy is properly a therapeutic activity, employed to relieve the puzzlement generated by (philosophical) misuses of ordinary language. The outstanding guide from * Deutsche Ludwig Wittgenstein Gesellschaft. Wittgenstein by Anat Biletzki and Anat Matar. Wittgenstein's atomism by Ian Proops. Wittgenstein on mathematics by Victor Rodych. private language by Stewart Candlish. Wittgenstein and aesthetics by Garry Hagberg. Duncan J. Richter's thorough article in The Internet Encyclopedia of Philosophy. Jean Laberge's article (in French) at Encéphi. Bj�rn Christensson's brief guide to on-line resources. Robert Sarkissian's summary treatment of Wittgenstein's philosophy. An article by Tadeusz Zawidzki in The Dictionary of the Philosophy of Mind. Andy Blunden's biography of Wittgenstein. A brief biography from Austria-Forum. 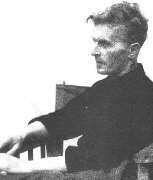 Discussion of Wittgenstein's mathematical significance from Mathematical MacTutor. Last modified 25 November 2011.